Get designed apps for the world's most widely used smartphone OS. As your business expands so does the data required. This enormous accumulates data can be consumed and accessed by mobile apps in the mobile world. Android developers have mastered this art form for mobile devices. The developers work on custom Android app development to organize these imposing pieces of apps that stand apart from thousands of app in the mobile market. If this is done thoroughly, then integrating with enterprise applications and big data capabilities with mobile apps can proceed in reflective business benefits. We at Going IT overture custom-built solutions in our custom Android app development services for distinct services for distinctive industry domains, such as Information Technology, Retail, Advertising, E-commerce, Education, Gaming, Travel and Hospitality, Healthcare, Manufacturing, Pharmacy, Telecom, Entertainment, Location and Weather, Auctions, and Banking. 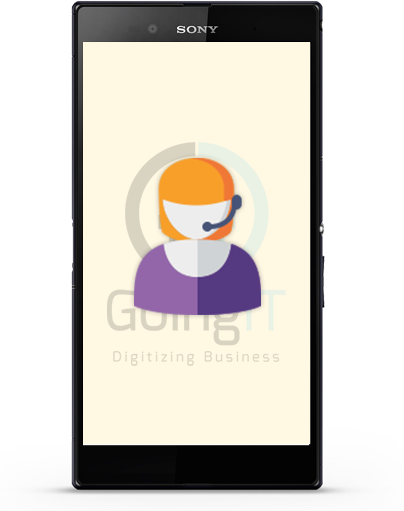 GoingIT Android development services have organized apps in categories, such as SMS gateway apps, E-commerce apps, Mobile VOIP apps, Native apps, Hybrid apps, HTML5 apps, and web-based apps. GoingIT has a patron-centric way and our endowed team of skilled Android Web App Developers striving to contribute you with an Android web experience like never before. GoingIT constructs applications and web pages as per your requisite. By exploring your web site on an Android smart phone will be a breeze. The applications are organizing for numerous Android versions. This insures that the applications and website invent is competing with every Android device feasible in the market. Being a prominent Android apps development company, GoingIT convert elementary idea into an incredible product with comfort as we make use of the best in the class libraries such as Android SDK. According to the value factor, these distinct libraries have entirely peculiar purposes to fulfill.